What will YOU do on your artist date? So I’m in the middle of a national park, in the middle of a bad hair decade. Decade. I can’t avoid the fact that I’m a Middle-aged Crazy Lady wearing baggy pants, collecting plastic junk fragments from the beach. Plastic junk fragments. Not to throw away, like any Sensible Middle-aged Crazy Lady does, but to PLAY with, as any Unsensible Middle-aged Crazy Art Lady does. Plus oyster shells, seaweed and string. Treasures. averts its eyes. ‘Groan’, thinks the gaggle. ‘How embARRassing. OMG I’m so relieved she’s not MY mother. Or grandmother.’ Or perhaps the gaggle is guilty for not being at school and it is not judging, but fearing Middle-aged Crazy Art Lady. Middle-aged Crazy Art Lady was an ultra-self-conscious teenager. Today, she doesn’t pause in her gathering frenzy to wonder what happened to her young person’s desperate need to appear Cool. Today, she has suspended her Tasks at Hand, along with the desperate need to appear Cool. She has treated herself to … an artist date. Julia Cameron, Queen of Creative Recovery, originated the artist date in her legendary The Artist’s Way book. You give yourself solo time in a context that feeds your artist spirit. Could be a visit to a book or button shop; museum or mountain. The outcome of today’s Middle-aged Crazy Art Lady artist date, complete with bad hair and baggy pants? The inner results and benefits from this arty baggy junky funky, nature-full time, include: peace, joy, inspiration, brain-rest, refreshment and revival. She wishes to show you some of the outer results. Well, the Beach Mandala above is one of them. 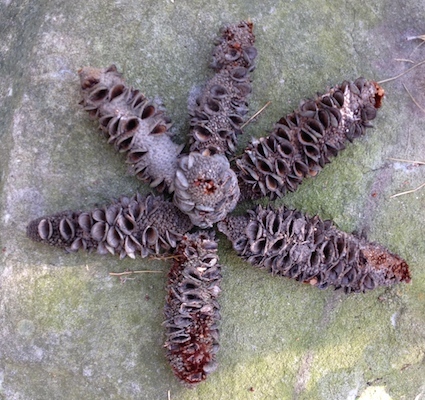 This entry was posted in Art of Emergence, Creative Process and tagged artist date, Artist's Way, creative refreshment, divine play, found object art, Julia Cameron, May Gibbs, middle aged by Art and Soul Space. Bookmark the permalink. Oh, I can relate! I posted my artist date stuff today – I did a bunch of mixed media. Cheers! : ))) Keep making amazing art. Oh! I love your blog name. It feels expansive and helps me breathe the tastes of salty sea in the moonlight. Well, the artist date and the middle-aged bit both resonate. Now the artist date, perhaps I misread, but I have mine daily – is that ok? Is it OK? It’s MORE than OK, I would think! I feel fairly sure that Julia Cameron would approve of a daily artist date. Creative abundance. Middle aged crazy art ladies are the happiest people on the planet, surpassed only by OLD crazy art ladies…..
Tee hee! I think Middle-aged Crazy Art Ladies are super happy while they are in the Art Zone. Does the happiness leak out to other times? This is the question. Good to have something about Old to actually look forward to, Val. Thank you, Jacqui! Can I ask a personal question? Are you too a MACAL? (easier to make acronym than write the whole Middle-aged….title each time)! Why thank you for egging me on! 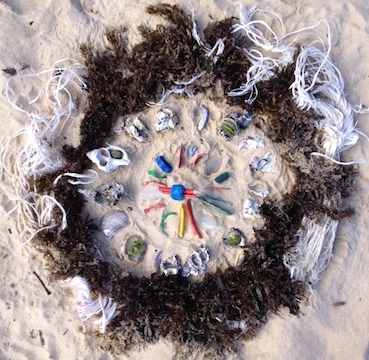 The beach mandala is fantastic! 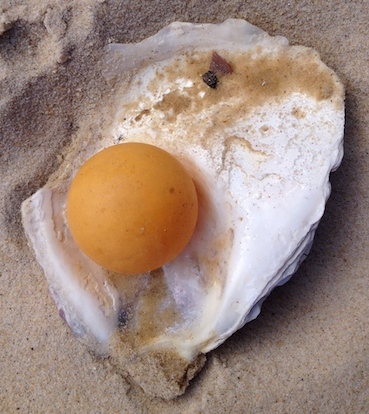 Random odds and ends beach collecting is one of my favourite things to do. Things that can be preserved are usually brought home and added to my “beach crap” jar, used as a book end, and one of my favourite things to look through. Great idea, Joy – a beach crap jar! Would it need to be huge though? What about driftwood and such? By the way, Middle-aged Crazy Art Lady was certainly totally absorbed in making the beach mandala. A woman on a mission. I just use old Moccona jars, or large old Mason jars. I have several, some themed (like the “random” one: bits of interesting drift wood, crab shells, urchins, seed pods, star fish, lures), white shells, all sorts of shells, cuttle fish bones. I use them as book ends. I have a huge rectangular vase I found that on it’s own was pretty ugly, but I shoved all sorts of larger pieces of drift wood in it (for crafting purposes), and it works pretty nicely, too! Joy – it’s great to be in touch with you. I begin to form pictures of beach-bleached driftwood, nutty, shelly, organic, relaxing spaces filled with light.